Are safe sleep practices a priority for your family? A right of passage for any family welcoming a new baby is to set up the nursery. A crib must be purchased and built and various items are used to create a warm, welcoming space for a new baby. But just how safe is your baby’s sleep environment? How safe are your family’s sleep practices? A recent study published in the September 2016 issue of Pediatrics found that recommended safe sleep practices are being ignored by many families. The study found that many parents are placing their babies in sleep environments that are unsafe and the recommended practice of placing babies on their backs to sleep is not being followed by many in favor of side and stomach sleeping. Titled Nocturnal Video Assessment of Infant Sleep Environments, the study videoed infants sleeping for one night at one month, three months and six months of age. Upon analysis of the one month old videos, researchers found that 21% were placed to sleep on unsafe sleep surfaces, 14% were placed on their sides or stomachs to sleep and 91% had loose items on their sleep surface including blankets, pillows, bumper pads, sleep positioners and stuffed animals. The videos compiled at the three month mark showed 10% of babies were placed on an unsafe sleep surface, 18% were placed on their sides or stomachs and 87% had potentially hazardous items on their sleep surface. Review of the videos at the six month mark showed 12% of the infants being placed on an unsafe sleep surface, 33% were placed on their sides or stomachs and 93% had potentially hazardous items on their sleep surface. Each group of videos at one, three and six months showed that when infants changed sleep locations during the night there was an increased likelihood of bed-sharing and side or stomach sleeping in the second location. In my work as a Child Sleep Consultant, many parents have asked me to assess their nursery during a consultation. There have been numerous times I’ve had to tell new or expecting parents that blankets, bumpers, plush items in the crib and cushion-lined bassinets are unsafe. 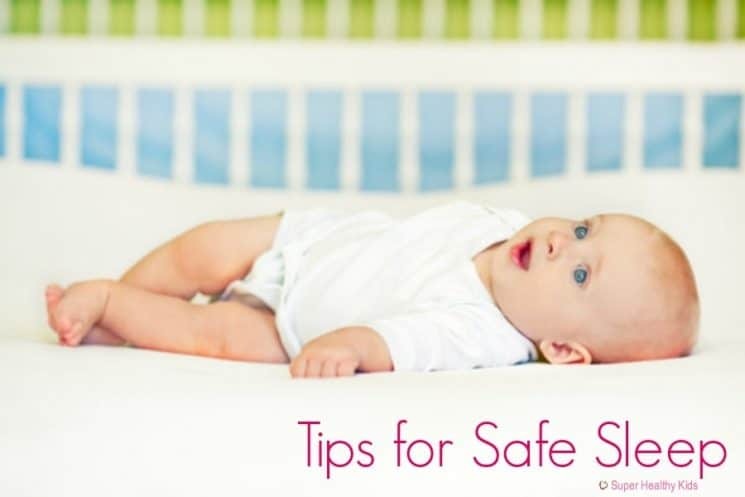 So what do you need to keep in mind when developing safe sleep practices for your baby? Follow the safe sleep guidelines set out by the American Academy of Pediatrics and the Canadian Pediatrics Society. Your baby should always be placed on his or her back, in a crib, cradle or bassinet. Prone (stomach) sleeping is a known risk factor for SIDS. Standard beds, water beds, air mattresses, couches, futons or armchairs are unsafe sleep surfaces for babies. While back sleep is lighter sleep, brief awakenings during sleep are a protective factor for SIDS. Always place your baby on his or her back to sleep, both at nap time and at bedtime. Your baby’s crib should be completely empty, except for the crib’s mattress and fitted sheet. Dress your baby in light sleep clothing, such as a one-piece sleeper, rather than using blankets. If a blanket is needed, infants are safest with a thin, lightweight, and breathable blanket. Keep your home at a comfortable temperature. Overheating is a risk factor for SIDS. Sleep in the same room as your baby but not in the same bed for the first 6 months. Babies who sleep in the same bed as their parents are at risk of SIDS, suffocation, or strangulation. Parents can roll onto babies during sleep or babies can get tangled in the sheets or blankets. Don’t allow anyone to smoke around your baby. Cigarette smoke is harmful to babies and increases the risk of SIDS. If your baby falls asleep in a stroller, car seat, swing, bouncer, sling or baby carrier don’t allow him or her to stay there for a long period of time. A crib, cradle or bassinet is a safer place for your baby to sleep. If your baby falls asleep during travel, transfer him or her once you’ve reached your destination. Discuss ‘back to sleep’ and a safe sleep environment with your baby’s caregivers. A baby who is used to sleeping on his or her back is at an 18% greater risk of SIDS when placed in the prone position for sleep on the first or second occurrence. Erich K. Batra, Douglas M. Teti, Eric W. Schaefer, Brooke A. Neumann, Elizabeth A. Meek, Ian M. Paul. (2016). Nocturnal Video Assessment of Infant Sleep Environments. Pediatrics, Volume 138, Issue 3. Alysa Dobson is a Certified Child Sleep Consultant with SleepWell Baby. She works with families to help them get the sleep they need. Alysa offers support to parents with children ages 4 months- 8 years old through both in home and remote consultations. She can be contacted at [email protected]. The reason most people don t follow this is because its a known fact you never wake a sleeping baby. my pedectrician even said most are suggestions. My baby falls asleep for her nap either in her car seat because we are shopping and she is in a moving truck or her stroller. She fax asleep on the couch with me for a nap and has never slept in a crib none of my kids did. You do what is best for the child not what someone tells you to do. I havr a happy 17 month old who is breastfeed and sleeps in a toddler bed. Most mornings I wake up and shes in bed with me. The best policy is to check facts as every year a new policy comes out. A baby who is used to sleeping on his or her back is at an 18% greater risk of SIDS when placed in the prone position for sleep on the first or second occurrence. The first part of this article states back is best. However this statement makes it appear that the back position leads to 18% greater risk of SIDS since it doesn’t define what “prone position” is. No wonder the public is confused and still using bumpers, blankets, and waking their babies in the night to add unnecessary layers of clothing to them. Hi! My husband and I have one 21 month old daughter. Do you have any suggestions about how and when to transition a toddler into being able to sleep with a blanket, pillow, etc? I would love to read a follow-up post from you! Thank you for any help you can give!